It’s Friday so I thought I’d share one of my latest finished objects. 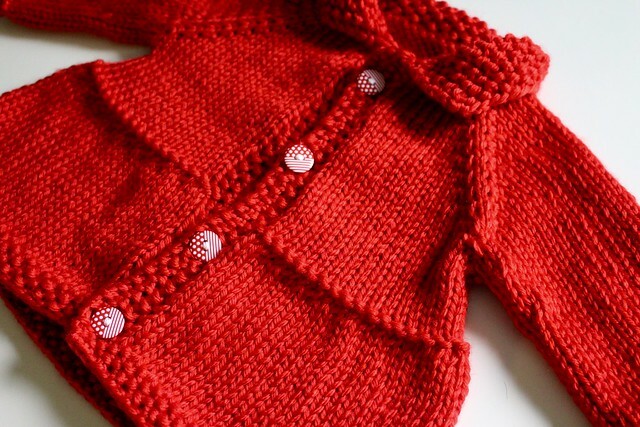 This is the Tiered Toddler Jacket I whipped up for Maddie last week. I actually made her the same jacket when she was first born but my gauge was off so it fit her once she was one. Her Mom said it was a favorite jacket for spring because it was warm, soft and lightweight. So I told her I’d be happy to make her a bigger version in the fall. Here’s why I really like this jacket, it’s a quick knit and it’s adorable. I used the Mighty Stitch Bulky yarn from Knit Picks because it’s an acrylic and wool blend that is machine washable and dryer safe! Whenever I knit for babies/toddlers/kids I try to find the softest yarn that’s also the easiest to care for because no parent wants to think about hand washing something after their child has made a mess. I also don’t want them to worry about ruining a hand knit and I want it to be able to handle some wear and tear. My only complaint with the yarn is that it leaves me in fuzzball city but eventually that goes away. On the jacket I adore the little seed stitch Peter Pan collar and that it gives this ruffled bottom effect. So girly and sweet. I was going to find fun little animal buttons but the sweet polk dot and striped buttons my friend Rachel sent me worked perfectly so I decided to just add those to the jacket. It’s all just too cute. I have plans to make another one of these for our goddaughter who is about to fit 6 months sizes so she’ll have a cute jacket for fall. These baby knits are just so satisfying when they fly off my needles. I’ve got a couple of other finished objects coming soon as well next week. Have a great weekend! Thank you! 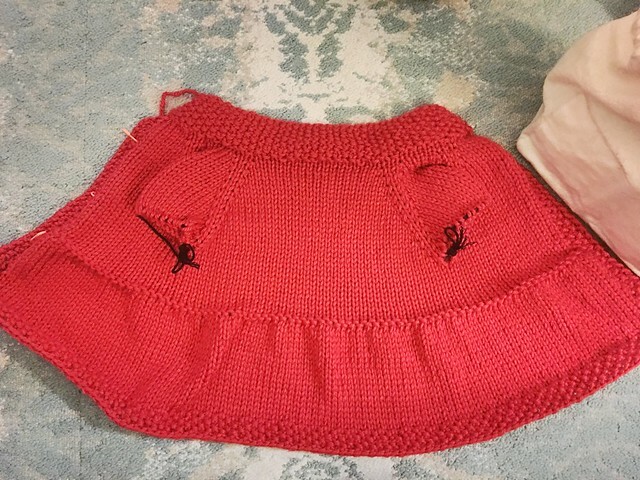 I love working on baby knits. Oh, my gosh. That is just the cutest thing I’ve seen in ages. Aren’t things for little girls the best?! LOVE! The color is terrific. The little recipient is beautiful and loved your first go at that pattern. I like to push my love of color on my friends and family. Plus kids need bright and fun colors! I kind of want an adult version for myself too! Really gorgeous, and the buttons add just the right pop to the whole picture. 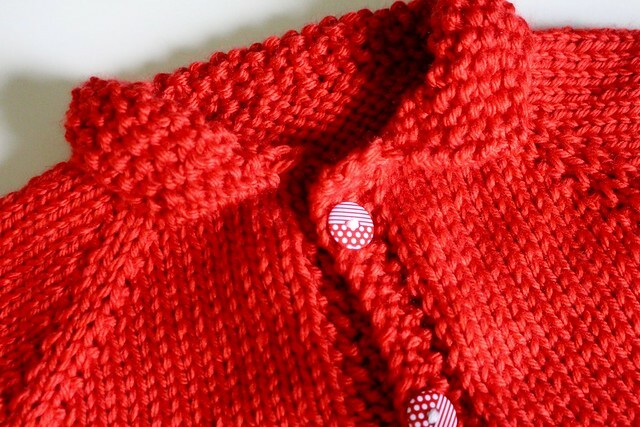 Kiddie knits are the best… I just got a picture of a little guy in a sweater I made for him and am still basking in the happiness of having a long-distance hug with him! It is like a long distance hug. I love it! that’s the best, when a knit turns out to be so successful you want to make another one! I love the cherry red, it’s stunning. What do you mean about the fuzzy bits, tough? Doe sit pill a lot at the beginning, and then evens out? I haven’t tried that yarn before, but I hear you on how kid knits need to be super easy to care for! It doesn’t pill into little balls but leaves little threads of lint behind until about the 3rd wash. I knit a sweater in worsted weight last December and had the same issue. Maddie is still the cutest baby ever!!! She is but she’s getting a little sister! There might be some competition. I like “fuzzball city” haha. I never could figure out how to knit clothes. Toys, sure. But clothes? I could never get the gauge right. And lots of patterns ask for “worsted weight” wool. I live in Australia, dafaq does worsted mean?? HA! Worsted is just a heavier weight. Not as big as bulky but heavier than dk weight. See we don’t have any of that. We have either weight in grams, or ply count. Omg she is so adorable!!! Are you interested in little girl’s fashion? 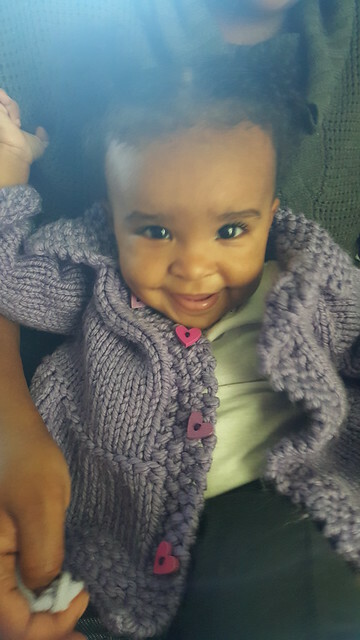 Someone I knew knitted similar cardigans and they turned out great for little girls. Classy and elegant. Well, if you are interested, would you check out my blog? It revolves HIGHLY sound little girls fashion and a new brand emerging in Australia. I feel you might find an interest in it.